We have been buying pork from a farmer for a couple of years now, it really is a wonderful thing. Pigs that get to root through acorns and roots are such happy pigs! On top of that, they are super tasty too!! 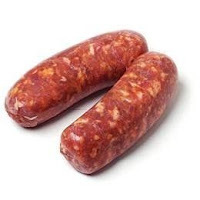 I have been trying to get a recipe nailed down for Italian Sausage and I have tried a few and always decided there was something I just didn't like something about them...and that something is fennel. Okay so fennel, it taste like licorice!?! So, I am wondering what business it has in my lasagna?? I finally just scrapped the recipes and seasoned up my own "Italian" Sausage. Please assume, this isn't the real thing. However it is really tasty. If pork isn't your thing, first I would like to say I'm sorry that you are living your life without ham and bacon. Second, if I haven't offended you enough so that you have left, you could easily use ground turkey or chicken for this recipe both meats would absorb the flavors fine. Mix ingredients into meat. I usually do this in the pan while I am browning the meat. You could do it in the raw meat and then put it into casings to make links. I haven't gotten that brave yet....yet!! !